PALESTINE FROM MY EYES Generating a fearless and humanising narrative on Palestine! Our Palestinian detainees have been battling the Israel Prison Service (IPS) with their empty stomachs since 24 April, embarking on the longest-known mass hunger strike in the history of the Palestinian prisoners movement. Hunger is the only remaining weapon they can use against the IPS and its well-armed Israeli occupation soldiers. They launched this hunger strike to call for an end to their detention with no charge or trial based on secret “evidence” submitted to a military court that is kept from the detainees and their lawyers — an unjust policy that Israel calls administrative detention. One hundred and twenty administrative detainees launched this mass hunger strike which grew to involve nearly three hundred prisoners, according to the rights group Addameer. Our dignified prisoners are striking in protest of Israel’s violation of an agreement reached with the IPS after the 28-day mass hunger strike that ended on 14 May 2012. According to that deal, the use of administrative detention — the key issue behind the hunger strike – would be restricted and administrative detention orders would not be renewed without fresh evidence being brought before a military judge. However, Israel did not abide by the agreement and has continued its practice of arbitrary administrative detention. Administrative detainee Ayman Tbeisheh from Dura village near Hebron in the occupied West Bank has exceeded one hundred days of refusing food in protest of his administration detention orders which have been continuously renewed since his last arrest in May 2013, according to al-Quds al-Arabi newspaper. Tbeisheh has spent a total of eleven years in Israeli jails, including nearly five years under administrative detention. According to Addameer, Tbeisheh first began to refuse food on 22 May 2013, immediately after his four-month administrative detention order was confirmed in a military court. He suspended his strike after 105 days, when he thought he reached a deal with the IPS. But this was soon broken as his order was again renewed, despite his deteriorated health. 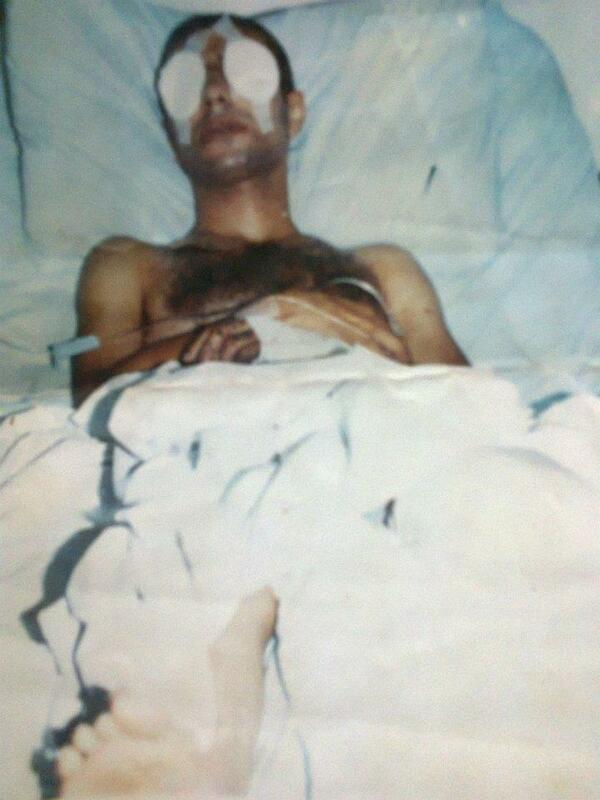 Soon after he regained some of his physical strength, he re-launched his hunger strike on 24 February 2014. Tbeisheh has since been placed in Assaf Harofe Medical Center where he lays shacked to a hospital bed that may become his deathbed at any moment. Ayman’s condition is no different than the rest of administrative detainees whose hunger for freedom and dignity drove them to launch the mass hunger strike that has been continuing for 51 days. Eighty hunger strikers have been hospitalized as a result of their ongoing hunger strike, but they persevere in this battle for dignity. Despite their weak bodies that are drained of energy, their hands and feet are shacked to their hospital beds. They are threatened with force-feeding on a daily basis, an inhumane and dangerous practice that Israel’s parliament, the Knesset, is close to setting into law. My father, who spent a total of fifteen years in Israeli jails, calls force-feeding “a death penalty.” He participated in the Nafha prison mass hunger strike in 1980 which lasted for 33 days. He was subjected to force-feeding and thankfully survived. But his comrades Rasem Halawa from Jabalia refugee camp and Ali al-Jaafary from Dheisheh camp were victims of this murderous practice that aimed to break their hunger strike, and were killed after being subjected to force-feeding. The Israel Prison Service escalates its oppression of the hunger strikers as their health constantly deteriorates. They put them in windowless isolation cells, keep their hands and legs shackled for tens of hours, deny them family and lawyer visits, and they even deny them an access to salt, which is necessary for their survival. 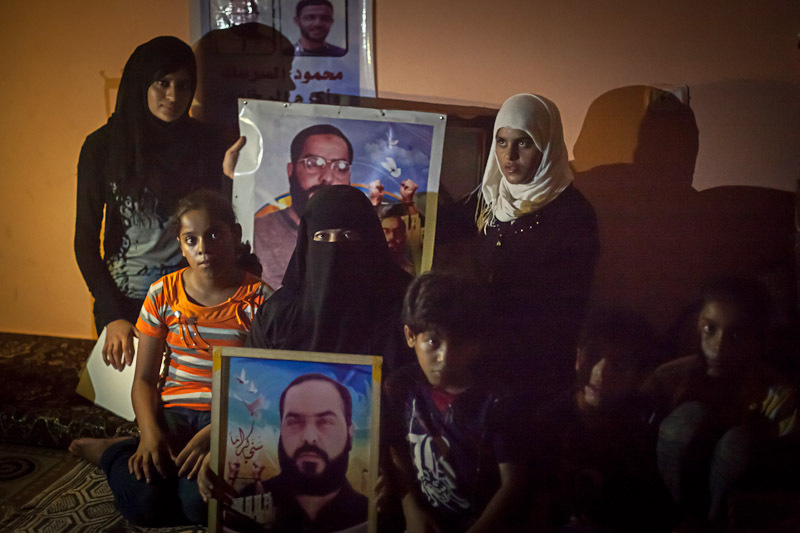 The strikers are committed to “hunger until either victory or martyrdom,” the same asKhader Adnan, Hana al-Shalabi, Mahmoud Sarsak, Samer Issawi and other ex-detainees who freed themselves after heroic battles of hunger strike against the IPS. A smuggled letter from Israeli jails written by the administrative detainees who are on hunger strike. Despite the chains and the prisons’ bars and walls, this is a will from those who are standing at the edge of death to the guards of our homeland, Palestine. After leaving the isolation cells which are no longer able to tolerate our pains, illnesses and corroded bodies, from our hospital beds to which we are shackled by chains and guard dogs, from amidst the jailers who keep watching our heart monitors that may announce our death any moment, from the edge of death, we send our call which could be the last for some of us. It might be the time to announce our will before we embrace our people as dignified martyrs. Our call is our voice, our scream, our will. We are the administrative detainees who are heading towards immortality, towards embracing the sun of dignity which might mark at the same time, the end of the battle for dignity. We raise our voice, hoping that it will reach our revolutionary people. First, we call upon you to intensify your support of the hunger strikers who are not yet martyred; the fighters who fight our fascist enemy with their bodies deserve from you a stand of loyalty that prevents the continuation of our bloodshed which will never stop until the achievement of our just demands. Second, the pains of hunger damaged some of our organs but some organs must be still in tact. As death is waiting for us, we declare that nothing will stand in the way of our sacrifices, even death. Therefore, we donate our functioning organs to the fighters, poor and oppressed people who are in need. We are waiting a visit from the International Committee of The Red Cross to endorse these donations. Third, we call on you to stay faithful to our blood and the blood of all martyrs who sacrificed their souls over the course of our Palestinian struggle. Faithfulness is not just through words, but through revolutionary practice that knows no hesitance nor weakness. Fourth, hold on to our historical and legitimate rights and never give up an inch of Palestine, from the river to the sea. The right to return is the bridge to our historic rights. These rights cannot be restored without resistance, which is the only language that our enemy understands. Fifth, don’t fail prisoners who remain alive after us, as those who sacrifice their freedom as a price for their people’s freedom deserve freedom rather than death. To our dignified people in Palestine and diaspora, to the free people and freedom fighters worldwide, we will let our screams be heard despite the darkness of Israeli jails, which are graves for the living. To people of dead conscience worldwide, our Palestinian people will continue the struggle until victory. We bid farewell with smiling faces. Reading their words which embrace pain and disappointment must make us all ashamed as we watch them die slowly. Changing our profile pictures to a picture that shows solidarity with their battle for dignity cannot do them much help. We have to move beyond superficial solidarity to serious actions that will bring meaningful change to them. Act before we count more martyrs among Palestinian heroes behind Israeli bars. Their death would be our shame. Feeling proud! Feeling high! Our defiant people in Jerusalem lifted my spirit which had been bruised through these last few weeks by the continuous entrapment in the besieged Gaza Strip, unable to leave for my graduation studies. 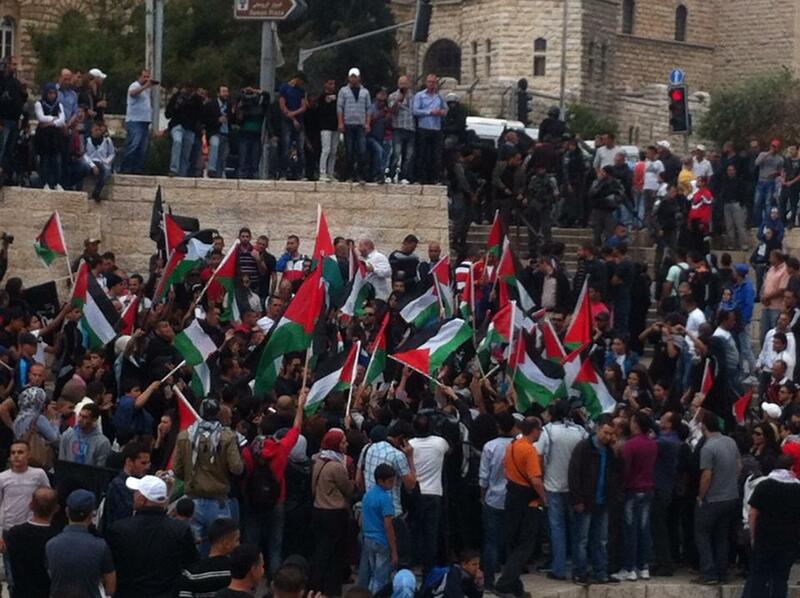 I cannot put into words how proud I feel of our people in Jerusalem. On Wednesday night, I had a long and exciting chat with my friend Amjad Abu Asab in Jerusalem who makes me feel very connected to Jerusalem, as if I am there amidst the bustle and lights of the old city’s streets. He described to me what happened and didn’t miss a single detail. Thanks to him, I could picture my dear city Jerusalem, Al-Amoud gate, the clashes and the demonstrations that happened there, the atmosphere, the anger, the smell, everything. Amjad was one the people who was attacked by the Israeli soldiers. But that couldn’t depress him and he still told me the story with a positive tone. “I was beaten up with batons today,” he said with laughter. I asked him how all these clashes started. “Many people gathered at Al-Amoud gate to rebel against the repetitive provocative raids of Al-Aqsa. Some radical settlers broke into the demonstration with two Israeli flags and kept waiving them amongst the angry protesters,” he replied. “There was a Palestinian salesman who sells shoes on a little table at Al-Amoud gate. One woman grabbed a shoe and threw it at that radical settler in response to his insulting provocations, and then all of a sudden all the protesters started showering shoes collectively at the soldiers.” The excitement and pride that I could feel in his voice as he narrated the story to me made me burst into laughter. When our Palestinian people in Jerusalem threw shoes at the faces of the Israeli soldiers and radical settlers, they were attacked with tear gas bombs and batons. You cannot compare our people’s harmless shoes to the murderous weapons the Israeli forces used to suppress our people. But our people’s faith in our just cause empowers them with strength, poise and determination to stand firm in the face of Israel’s brutality and to keep resisting. “A tear gas cannister hit my friend’s head and he was sent to hospital. He was rescued miraculously because the bomb hit the wall before it hit his head. Otherwise he could have been martyred,” Amjad said. Amjad’s friend was sent to hospital, but was thankfully released after a few hours. His situation is stable. About 40 other Palestinians were injured in these clashes including three women, some paramedics and journalists. 15 people were jailed including three children, Ahmad Khanfar 14, Omar Al-Sheilk Ahmad 15 and Omar Abu Sarriya 14. Our Palestinian brethren in Jerusalem were terrorized, wounded and detained in the name of maintaining security and protection for the Zionist colonial settlers. The Israeli Occupation Forces were savage and aggressive but they failed to make our people surrender. Israel’s brutality inspires our determination to keep up the fight. Every time they tried violently to disperse the crowd, they gathered again in different locations. The Israeli soldiers kept chasing them wherever they went. Keep an eye on Jerusalem. Our people in Jerusalem face such challenges and risks on a daily basis. These vicious practices by the Israeli Occupation Forces have only one goal: to continue the systematic ethnic cleansing of our people. At this very moment, passing through Rafah border crossing and travelling abroad for my MA studies in Turkey is no longer what I wish I could do. I don’t wish for anything more than for me to be in Jerusalem! This post is dedicated to my friends and strong people in Jerusalem. I would like them to know that we feel for you. Even if Israel builds a thousand more checkpoints to divide our people, we will stay united and feel for each other’s suffering. Keep your chins up you fighters of Jerusalem! They will not manage to Judaise our Arab Palestinian Jerusalem or our holy Palestinian soil. Free Palestine from the river to the sea! Gilad Shalit, the Israeli soldier captured by the Palestinian resistance from his tank and held for five years, is known worldwide as a “victim” of the “terrorist” Palestinians. But seeing how little the world knows of our Palestinian political prisoners infuriates me. There is not only one. Nearly five thousand Palestinians are behind Israeli bars, which are more like “a grave for the living.” as my dad ad, who spent 15 years in Israel’s prisons, frequently describes his detention. Last night, while following the latest news on political prisoners, I saw a headline reading, “The medical situation of the detainee Muhammad Brash is deteriorating.” I’m certain few have read that name before. Don’t tell my mother that I can no longer see. She can see me, but I can’t see. I fake my smiles when she shows me the photographs of my siblings, friends, and neighbors, as she doesn’t know that I have become blind after illness spread in my eyes until the darkness filled me. Don’t tell her that I waited several years to have a cornea transplant surgery. But the Israeli Prison Service kept procrastinating and procrastinating, giving my eyes every reason to leave me. Don’t tell my mother that the shrapnel of the bombs which managed to hit me is still settling in my body, and that my left leg was mutilated and replaced with a plastic one. Don’t tell her that the other leg rotted and dried of blood and life. Don’t tell my mother that the prisoner survives a lifeless existence and is treated as subhuman. He is sentenced to see only ashes and iron, darkness and hopelessness. Tell her I am alive and safe. Tell her I can see, walk, run, play, jump, write, and read. Don’t tell her I shoulder my pains on a walking stick, and can see every martyr as a moon, soaring in the sky and calling me with the power of lightning, thunder, and clouds. Don’t tell her I suffer from sleepless nights, and that I live under the mercy of painkillers until they drug my body. Don’t tell her that I keep losing my things, and I barge into the iron beds or another prisoner sleeping close to me, to wake him to help me reach the bathroom. Don’t tell her that wakefulness always hurts me and sleep never visits me. Don’t tell her that Israel, a country in the 21st century, has turned its prisons into places where diseases are planted and bodies slowly ruined. Don’t tell her that I have learned the names of horrible illnesses and strange medications, along with all types of painkillers, while watching my friend Zakariyya fall into a coma, with an ending unknown to me. Don’t tell my mother about the sick prisoners whose diseases launched fierce wars against their bodies: Ahmad Abu Errab, Khaled Ashawish, Ahmad al-Najjar, Mansour Mowqeda, Akram Mansour, Ahmad Samara, Wafaa al-Bis, Reema Daraghma, Tareq Asi, Mutasim Radad, Riyad al-Amour, Yasir Nazzal, Ashraf Abu-Thare, Jihad Abu-Haniyye. The merciless Israeli prisons slaughter them; there is an illness and a carelessness in a country that enjoys slow death sentences and funerals for others. Tell her that I never stop dreaming of being wrapped in her tender arms. My nostalgia for her is great, and her soul never leaves me. Tell her that I have kept her gifts: my Arab tongue, my purity, my symbols stuck on the wall, all of which soothe my pain every time the light disappears around me. Tell her that I always embrace her holy prayers, to survive the dark cloud that surrounds me after the pain has spread in my body and tortured me. I might return to her or I might not, but I leave the answer to this question open, although I’ve chosen to be spiritually close to her heart. Tell her I am sorry I have no control over my future. Tell her I am not too far from her, and I get closer every time a bird flies and a fire burns in my eye, and barbed wires wound me, carrying me to her arms. This letter began my spiritual relationship with Muhammad Brash’s persona. He became a new source of inspiration in my life and deepened my faith in the cause of the Palestinian political prisoners. 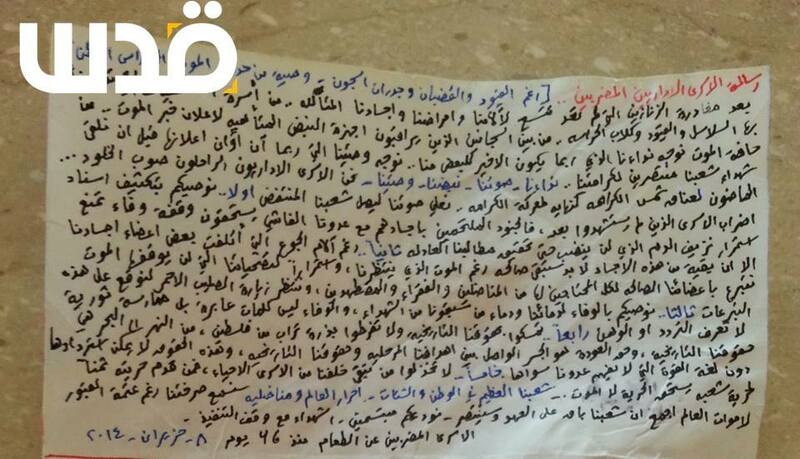 Muhammad somehow managed to smuggle his moving letter from Eshel prison during the campaign of disobedience, the 22-day mass hunger strike launched at the end of September 2011. He shared his own experience of medical neglect, attempting to shed some light on the Israel Prison Service’s inhumane practices against him and his comrades. Quality medical care always tops the list of our detainees’ demands whenever they start a mass hunger strike. Eager to know Muhammad Brash in depth, I searched every possible source for more information on him. I wished I could visit his family and listen to their story first-hand. Sadly Israel’s apartheid made it impossible for someone from Gaza to meet another from West Bank, even though it’s only a couple of hours away. After a long search, I found a Facebook page called The Detainees Muhammad and Ramzy Brash. Only then I realized that Ramzy Brash was Muhammad’s brother, who shares his prison cell and is also sentenced to life-long detention. I left a post on their page saying how moved I was by Muhammad’s letter. Shortly after that, I received a message from his 22-year-old brother, Hamza Brash, saying he was ready to tell me all about Muhammad. Muhammad’s family is originally from Abu Shosha village, which was ethnically cleansed in 1948. His grandparents fled to al-Amari refugee camp in Ramallah, where they still live. At the start of the second Intifada – which began in September 2000 – Israeli occupation forces invaded al-Amari, massacred people, and demolished their houses. An armed soldier shot Muhammad’s 15-year-old brother Subri, cutting his life short while he was throwing a stone. This moved Muhammad to join the resistance and defend his people’s dignity and sense of security. Muhammad has served ten years of his sentence, and no one knows if he will ever be released. Ever since his arrest, he has suffered from medical neglect every day. It’s this that left Muhammad in two forms of darkness: His blind eyes that see no colors but black, and his dark cell where he dies every day and may spend the last day of his life. Most of Israel’s shameful crimes, which offend any sense of propriety in any heart with any shred of conscience, were committed in the name of security. But how can they justify them in Muhammad’s case where he can hardly endanger their safety? The Palestinian football player Mahmoud Sarsak walks freely in Gaza’s streets and alleys, breathing victory among the steadfast people of the Gaza Strip. He acquired his strength to hunger for 96 days from Mahatma Gandhi’s words, “First they ignore you, then they laugh at you, then they fight you, then you win.” Gandhi’s promise came true, and Mahmoud actually won the battle of empty stomachs. Read my account of visiting Mahmoud Sarsak after his release. Mahmoud was released from the Ramla Hospital Prison on July 10 after he revealed Israel’s crimes against humanity and made it submit to his demands. But his happiness remained incomplete. His thoughts are still in a place he described as “a hospital for torture, not for treatment,” with his comrades he left there, especially Akram Rikhawi, Palestine’s longest hunger striker in history. 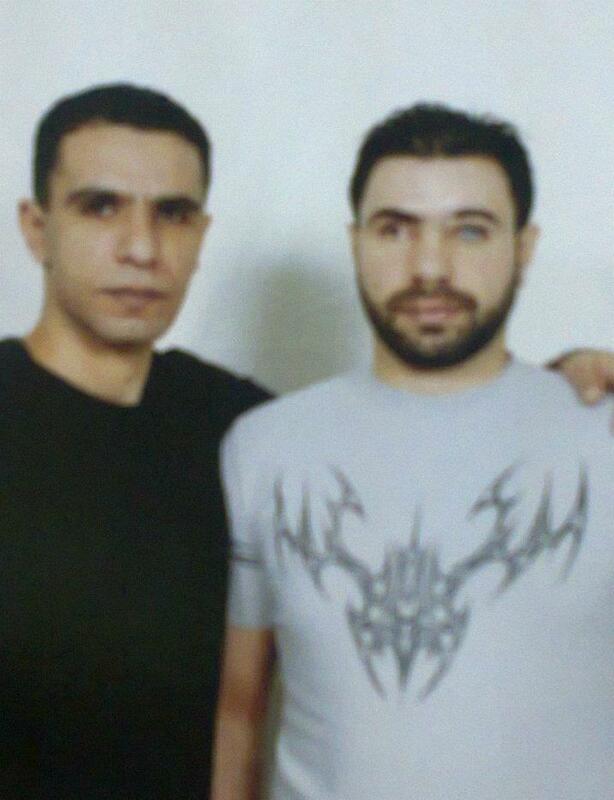 Before Mahmoud’s release, the Israeli Prison Service sent him to Akram to pressure him to break his hunger strike. Mahmoud took it as an opportunity to meet Akram for one last time, and to carry messages he wanted to deliver to his family. Akram was very happy for Mahmoud, and had faith that his victory would follow Mahmoud’s sooner or later. We all sat on the rug close to a lantern, the only light in a sitting room filled with photos of Akram. As his wife Najah started speaking, I learned that Akram is the son of a martyr, the brother of another martyr, and has a brother detained in Nafha Prison: a typical Palestinian family’s sacrifices for the sake of freedom and dignity. His father died in the First Intifada, while his brother was killed in the 1990s during a ground invasion by the Israeli Occupation Forces (IOF) in Rafah. His detained brother, Shady, became disabled after he refused food for 22 days during the mass hunger strike in Israeli prisons which began this year on Prisoners’ Day, April 17. One of Akram’s youngest twin who were born a little before his arrest and knew their Dad from photos. “I was the dearest to his heart, and he sometimes teased me, saying that I was the reason for his detention,” she said. “On June 7, he walked me to school in the morning before my exam. He spent the entire trip reminding me that I should have faith in Allah and not worry. Then he headed to Gaza City. On his way home in the afternoon, the IOF stopped the vehicle at the Abu Ghouli checkpoint between Gaza City and Rafah and demanded to see all the passenger’s IDs. After handing over his ID, Dad Akram was immediately arrested. In his first letters from prison, he wrote that his friends had warned him that the situation was worrying, and that he should remain in Gaza. He refused, saying he needed to check how I did in my exam.” Yasmeen said this with a slight smile on her face. After Akram’s detention, she could barely continue her examinations, and finished them with an overall score of 55. Don’t choose to look away. Akram Rikhawi is in desperate need of your urgent actions to save his life. It is late, but it is not over. You can still do something, anything, to contribute to his survival. Its 10 pm, time for the power-cut in our region of Gaza city. Guess what? This time I didn’t sigh. I laughed thinking of one of my friends who mastered guessing if I have power at home or not, just from hearing my voice’s tune when he calls on the phone. He always teases me by saying, “Is your body connected to an electrical wire? You turn off whenever power cuts off!” Usually, I would just escape from the darkness to sleep. This night, I’ve decided not to allow my frustration to take over and immediately make use of the charge left in my laptop. I put my headphones in my ears to listen to Sameeh Shuqair’s song “Think of Others,”trying to cover the horrible noise of generators that already took over the region. Think of Others is originally a poem written by my favorite Palestinian poet and my teacher of life and humanity, Mahmoud Darwish. “You’re such a dreamer.” Many of my friends describe me this way but I am not sure whether it is a good or bad thing. What I know is that Mahmoud Darwish is one of the people who had a deep impact on my life as his words always took me to my fantasy world that I always dreamed to live in, a pure world that is full of love, peace and people of conscience . While listening to the beautiful lyrics of Think Of Others, my thoughts were for our political prisoners in the Israeli jails. I translated its lyrics not only for you to share with me the joy of the song, but also to demand you to listen to our detainee’s appeals to think of them. As you fix your breakfast, think of others. Don’t forget to feed the pigeons. As you fight in your wars, think of others. Don’t forget those who desperately demand peace. As you pay your water bill, think of others who drink the clouds’ rain. As you return home, your home, think of others. Don’t forget those who live in tents. As you sleep and count planets, think of others. There are people without any shelter to sleep. As you express yourself using all metaphorical expressions, think of others who lost their rights to speak. As you think of others who are distant, think of yourself and say “I wish I was a candle to fade away the darkness. The mass hunger strike that was launched by more than two thousand of our political prisoners ended on May 14. Ending the policies of detention without charge or trial, and solitary confinement was on the top list of the strikers’ demands. I was lucky enough to witness that emotional scene of people’s reaction to that victorious news of its end in the sit-in tent in Gaza city. I can recall clearly their happiness that was mixed with tears of pride and joy. Sweets started being distributed all over, even taxi drivers dropped by to get their share. 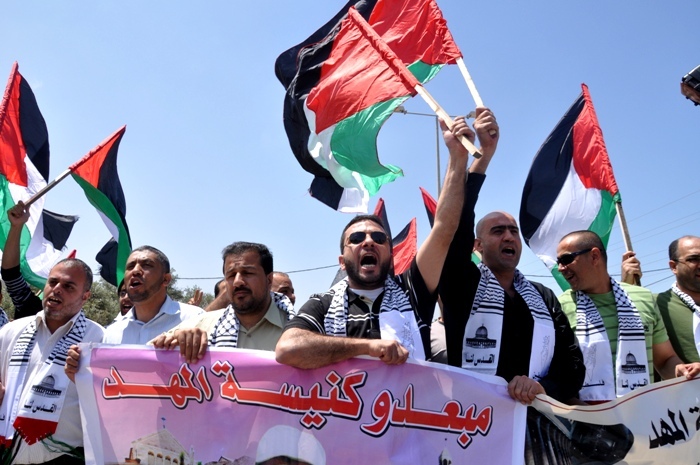 The songs of victory didn’t stop playing in the background while people were waving Palestine’s flags, chanting, and dancing, celebrating our detainees’ success in forcing the IPS to endorse an agreement that was supposed to be enforced. It was one of the best moments I lived in my life. Despite that, I learned a very important lesson for life: I shouldn’t get too excited over anything before I see it happening in front my eyes, especially when it comes to promises or agreement that Israel endorses as Israel is the last to stick to any. Hearing that the isolated detainees will be moved from solitary confinement cells to normal jails fills me with joy. My happiness reached its peak as I heard that Hassan Salameh, who spent 13 years of his detention in a solitary confinement where he ended up having intimate relation with cracks on the walls or the insects, has been moved to Nafha Prison and has eagerly registered at Al-Aqsa University in the Gaza Strip to study history. But later I got frustrated when I heard of the story of the Gazan engineer Dirar Abu Sisi, the only one left in isolation. After seeking details of Dirar’s case, I became sickened with Israel. Dirar was kidnapped from a train on 18 February 2011 in Ukraine, his wife’s country where he was seeking citizenship. Dirar was handcuffed, blindfolded and placed in a coffin after his kidnapping and once he opened his eyes, he found himself jailed in Israel. He has been never engaged in resistance or in any political party. Israel has nothing against him but fear of his geniality. Israel has accused him of “conspiring” with Hamas, however even his professors in Ukraine — were he studied — have refutedIsrael’s claims that he studies weapons systems with them. However, I feel that Israel is trying its best to fabricate any accusation against him. They are very concerned with devastating his mentality. 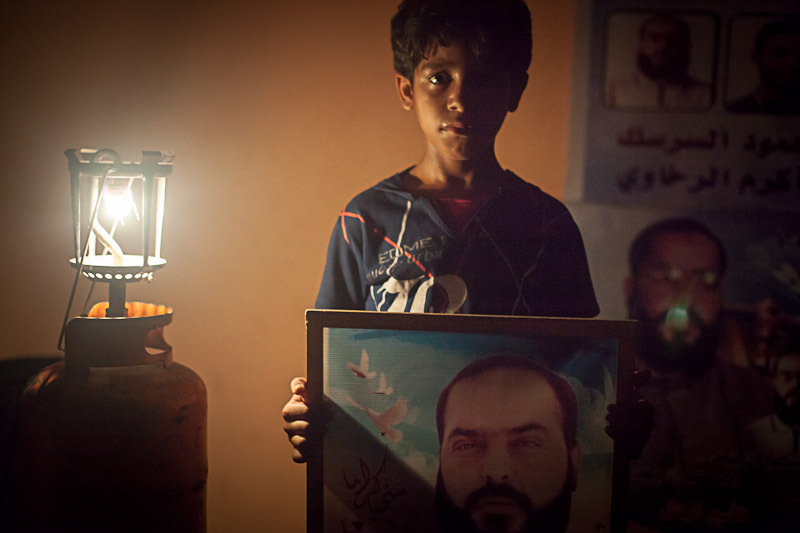 His family has said that Israel fears him because he managed to modify the turbines in Gaza’s sole power plant, so they can run on a cheaper form of diesel that comes from Egypt, rather than on fuel imported from Israel. He was just “the brain of the power system” who managed to light up Gaza when he repaired the sole power plant in Gaza, which produces 25% of its total electricity needs, after getting destroyed by the Israeli occupation forces during the so called Operation Cast Lead in 2008-09. Due to that, cowardly Israel fears Dirar Abu Sisi despite his detention and continues to practice its inhumane policies of solitary confinement against him, which exemplifies an open violation of the latest agreement reached with Egypt regarding our prisoners. Amnesty International says that Israel has renewed at least 30 administrative detention orders and has issued at least three new ones since the deal was signed. Due to these continuing violations, the battle of empty stomachs continues, led by Mahmoud Sarsak, a 25-year-old Palestinian national footballer who’s playing now the hardest match of his life, the match of defending his life’s dignity. Sarsak has been on hunger strike for 84 days. He was captured at Erez checkpoint when Israel stepped in his way toward achieving a dream he was always longing for: participating in a national team contest in the West Bank, in Balata Camp. This was on 22 July 2009. Since that date, he has been held without trial and without charges and was banned from family visis just like all other detainees whose families are in Gaza. Even after the release of the Israeli prisoner who was held in Gaza, last October, and the deal that Israel signed after the last mass hunger strike, nothing new has happened regarding coordinating family visitation for the families of detainees from Gaza. Mahmoud Sarsak is in grave condition according to an independent doctor from Phyisicians for Human Rights – Israel who examined him. However, the sporting world and the international community in general are barely paying attention. I appeal to you to deeply, ponder the words of Mahmoud Darwish’s poem and think of others! Whatever insignificant support you can contribute at easing the life of Dirar Abu Sisi and rescuing the life of Mahmoud Sarsak will help. And remember, their victory won’t be only theirs, but a triumph for humanity! On May 10, 39 Palestinians from Bethlehem completed eleven years of deportation from their precious homes. 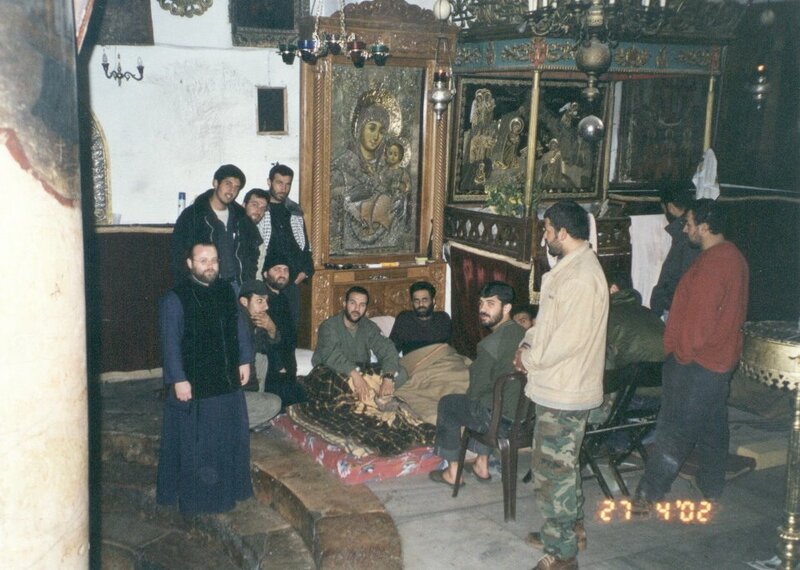 On the very same day, eleven years ago, they were expelled from the Church of Nativity after a siege by the Israeli Occupation Forces that lasted for 39 days: 26 men went to Gaza, 13 to Europe. Since that tragedy, which marked another form of ethnic cleansing, this day has been called ”Deported Palestinian’s Day”. Since the last swap deal in October, hundreds of Palestinians have joined this category, as 203 ex-detainees were convicted to indefinite deportation. Moreover, ex-detainee Hana’ Shalabi was recently deported from Jenin to Gaza after hunger striking for 45 days to protest having been re-detained after midnight by a huge, aggressive force of Israeli soldiers, and held under administrative detention on February 16. Israel has intensively deported people from the West Bank to either the Gaza Strip or countries such as Turkey, Syria and Qatar. Israel offered administrative detainees Bilal Diab, Thaer Halahla, and Jafar Ez Al-Din Qadan, all on hunger strike for over two months, deportation to Gaza, but they refused this horrible offer and bravely insisted on continuing their battle of empty stomachs against Israel’s injustices and violations. Mr. Fahmi Kanan and other Palestinians including deported ones from the church of Nativity marching on Deported Prisoner’s Day calling for ending their exile. On May 10, hundreds of people from all generations marched to the sit-in tent for Palestinian political prisoners in Gaza to share the continued suffering of the deported Palestinians. The experience of exile, with all its pain, repeats itself hundreds of times in Palestine at the hands of Israel, as it openly violates the same Geneva Convention it ratified in 1951. One of the people I am very proud to have met through the weekly protest for Palestinian detainees is a deportee from the Church of Nativity, Fahmi Kanan. Fahmi has been a good friend of mine, despite our difference in age: He is 43 years old, while I am only 20. 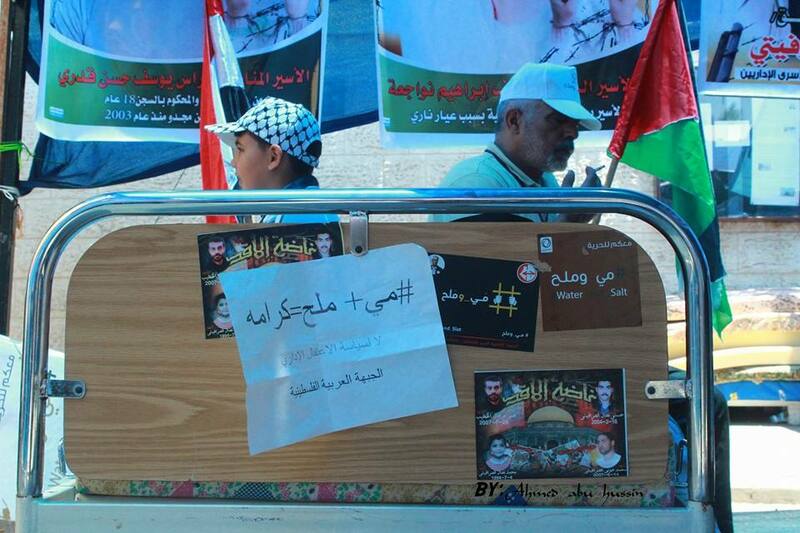 He makes sure to attend every Gaza activity organized in solidarity with the Palestinian detainees and their families. Afterward, I learned that Mr. Fahmi is the spokesman for the people deported from the Church of Nativity. Having a shared passion for a just cause, Mr. Fahmi and I get along well. 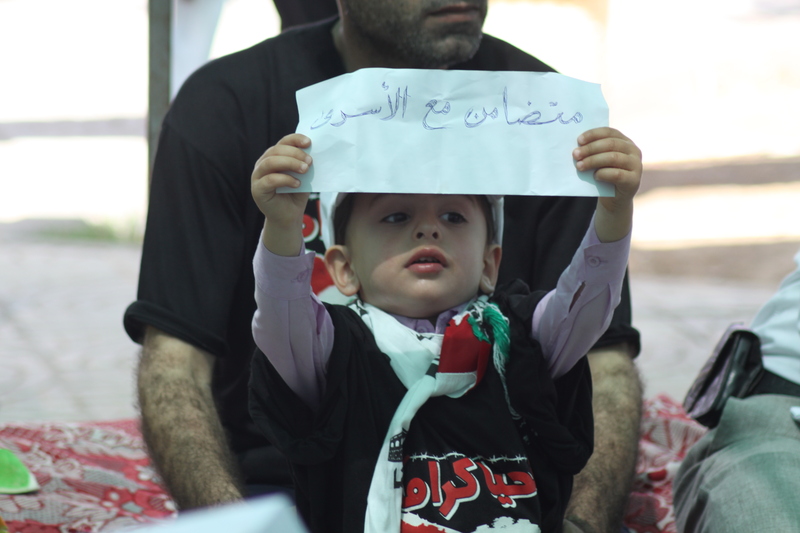 He always brings his kids with him to the protest for detainees. I’ve gotten to know him as a person, not merely as a political activist. I believe that children are reflections of their parents. In Mr. Fahmi’s case, his children are outstanding reflections. I always tell him, “If I ever have a child, I’d like to raise her or him the same way you did.” I see a bright future for Palestine through his kids who are, despite their young ages, very well-educated about Palestinian issues. On the second day of Eid al-Adha last year, I saw him with all his kids in the weekly protest for detainees outside the International Committee of the Red Cross. When I asked him how his family in Bethlehem was doing, he replied, “I was on the phone with Dad this morning, greeting him for Eid. He is getting older. He fears that his death will be soon as he suffers from some health problems. My heart aches when he tells me that he wishes he could see his grandchildren before he dies.” I asked his 11-year-old son Nasr whether he was enjoying his Eid or not. He replied with a sad look on his face, “I feel like it is the same as any other day. All our relatives are in Bethlehem, and Eid without family is tasteless.” His words touched me very deeply. 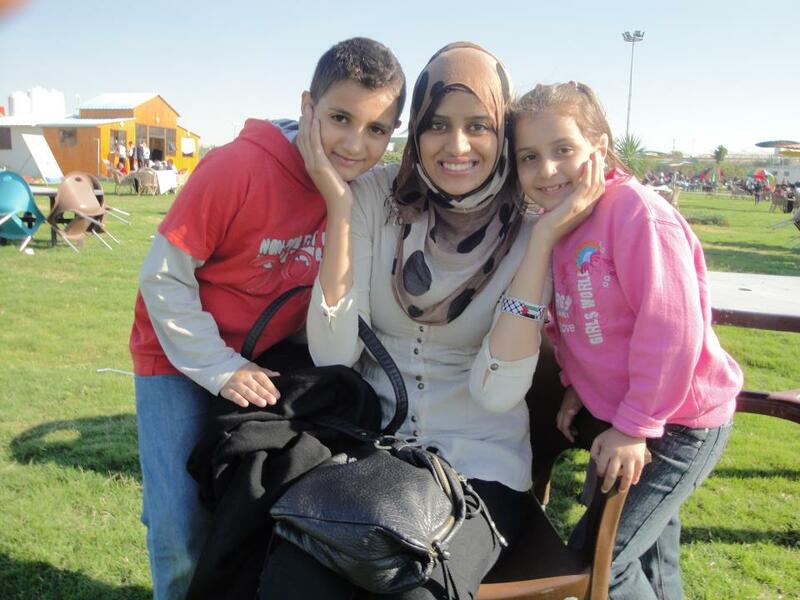 Two of Mr. Fahmi’s cute kids, Nasr and Israa, and I in a park in southern Gaza during Al-Adha Eid last November. Palestinians consider the United Nations a partner of the Israeli Occupation because of its silence. Security Council Resolution 607 “[c]alls upon Israel to refrain from deporting any Palestinian civilians from the occupied territories” and “[s]trongly requests Israel, the occupying Power, to abide by its obligation arising from the Convention.” But when it comes to reality, the UN chooses to take no action against Israel’s violations. We, the Palestinian people, don’t want resolutions, we want actions! We want real justice, not just words tossed into the air! The sit-in tent for Palestinian political prisoners has been moved from the International Committee for the Red Cross to a central park near the statue of the Unknown Soldier in the middle of Gaza City. It is one of the few green places and thus one of the most lively places in Gaza, where people escape from their dark houses and seek fun and relief, or to simply waste their times observing others. However, the sit-in tent is now used differently, to send messages of solidarity with our Political prisoners who have been on a mass hunger strike since April 17, and to show anger with the Arab and international community and all human rights organizations, which keep calling for human rights, democracy and justice, but when it comes to our prisoners, they do nothing but watch them dying and remaining helpless. The solidarity is taking many forms, such as lighting candles, making marches, creatively performing plays, songs, poetry and Dabka, joining a symbolic hunger strike. In Gaza’s sit-in tent, 50 men and 45 women have joined a symbolic hunger strike in solidarity with the detainees since May 2, including prisoner’s wives, parents, sisters and former prisoners. Those people have been protesting day and night. The tent is their shelter as long as the revolution of hunger is going inside Israeli prisons. Having been in the solidarity tent daily, even more than in my house, I’ve witnessed most of the cases among hunger strikers whose health conditions got deteriorating. Several cases were sent to hospital for low or high blood pressure and so many people fainted or emotionally collapsed. Ambulances and doctors never leave the tents anymore as if they have full time job at the tent. 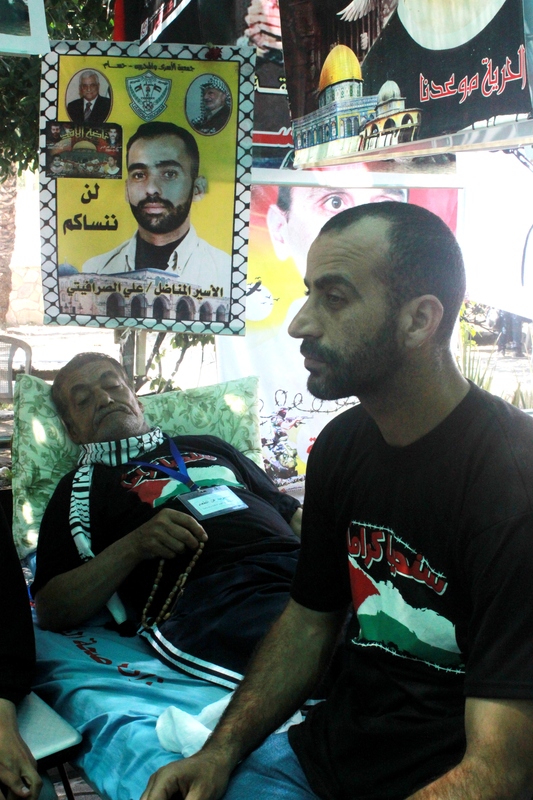 While making the daily tour to show support and admiration to the hunger strikers in the tent, I was surprised to see Abu Hosny Al-Srafity wearing the strikers’ t-shirt that distinguishes them from others, and which beautifully designed with the Palestinian flag with “we’ll live dignified” written on it. Abu Hosny is a 66-year old detainee’s father whom I met since I started going to the weekly protest in the ICRC for political prisoners. Whenever we meet, we greet each other and have a short and informal conversation, but never had a real one that would make me feel like knowing him intimately. Finally, I had this conversation with him after I said “You, too?” out of surprise reacting to seeing that t-shirt. Our conversation was still in the beginning. What came next was heartbreaking. I was amazed at his high spirit and his determination but this profound chat we had clarified to me where he got that strength from. Let’s pray to all detainees’ families to celebrate the victory of their detained sons in their battle of empty stomachs against the armed merciless jailers and pray that this victory will result in allowing them to visit their sons after over 6 years of family visits’ ban. Let’s support our prayers with taking serious actions. Shahd Abusalama is a Palestinian writer, artist and activist, born and raised in Jabalia Refugee Camp, Gaza, and now based in the UK. She is one of the co-founders of Hawiyya Dance Company who explore solidarity, identity, cultural resistance through Dabke, the folk dance of Palestine. She is a PhD student at Sheffield Hallam University, focusing on Palestinian cinema. She holds an MA in Media and the Middle East from SOAS, University of London, and a BA in English Literature from Al-Azhar University - Gaza. 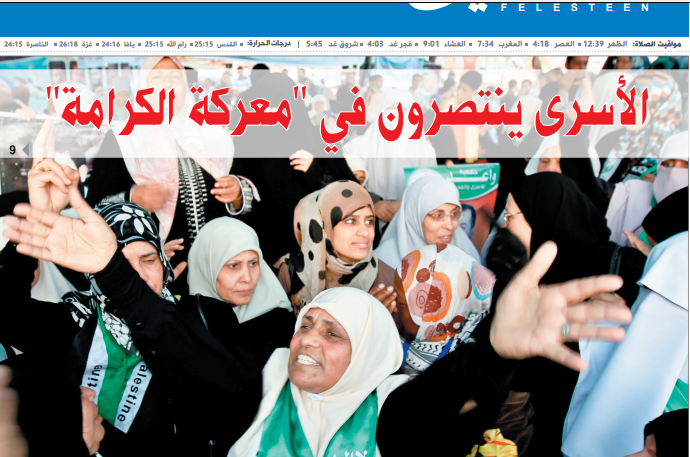 Why bomb Gaza’s Said al-Mishal Cultural Centre?